Band members had a rehearsal last week at Ellensburg High School. The band plays a wide variety of songs and is a very upbeat group. 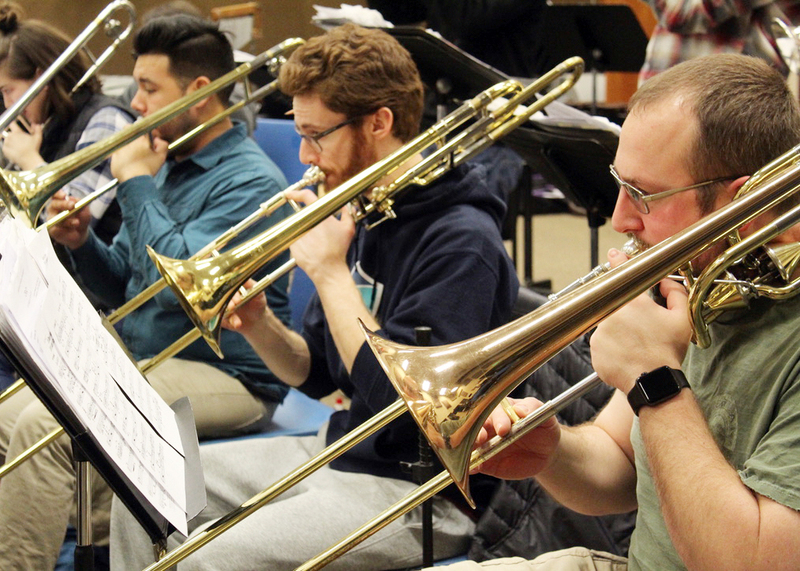 This year on Valentine’s Day, campus activities and The Ellensburg Big Band are putting on a dance night open to anyone. The Ellensburg Big Band will be taking attendees back to the 1940s by playing jazz and swing dance music all night long. The event is free to CWU students with student ID and costs $5 for general admission. The event is located in Sue Lombard Hall and will take place from 8-10 p.m. There are two ballrooms where the dancing and band will be set up. There will be refreshments, desserts and places to sit. For those who aren’t experienced with swing dancing, from 6-8 p.m. there will be swing dance lessons in the same location. They are free for students and $5 for others. If non-students pay $5 for lessons, they will receive free admission into the main event. Besides the dancing, there will be activities during the night like a photo booth, jumbo tic-tac-toe and trivia games like “how well do you know your dance partner.” There will also be roses for sale. Attendees are encouraged to dress semi-formal, but any attire is welcome. Libby Akin, event coordinator for campus activities, explained why she is excited for the night. “I’m hoping this event will feel more formal and will have a different atmosphere than we usually have at events at CWU. I’m excited to have the band there because they will bring a new atmosphere,” Akin said. Bruce Herman, manager and trumpet player of the Ellensburg Big Band, explained that the band started as a local community ensemble but has since become a more professional group. He said they have players that come from Seattle, Yakima and all over the region. The band consists of 19 members who range from high school students to retirees. The band rehearses weekly and performs at events once or twice a month. Herman said they keep themselves busy and play during every month of the year. They have even taken a trip to Japan and hope to go to a jazz festival in New Zealand this fall. The band will always have people who are there to have a fun time, but they have also added members that have a professional background in music through teaching or performance. Herman has played the trumpet since he was a kid and explained why he loves music so much. “It’s one of those activities you can do your whole life. Age becomes unimportant, we are all friends and it doesn’t matter how old you are. There aren’t a lot of activities like this that you can do your whole life. I love the music, and the comradery and friends are just as important to me,” Herman said. The band does get paid for the events they play at, but Herman explained that the money gets used to cover expenses like equipment, music and travel. “People are here because they love the music, [they’re] not here to make a living,” Herman said. Judy Coder, the guest vocalist for this event, has worked with the band in the past and tours professionally across the country. “It’s really fun to play music that gets people up off their feet and propels them to dance,” Coder said.